Amazing food at Cutler & Co. | 15,000kms of Food! Amazing food at Cutler & Co. I was totally blown away by how great dinner was at Cutler & Co. Whilst many rave about it, I had my reservations as my first and only visit years ago was very average. Perhaps back then it was opening month and they were still sorting out teething issues. My boyfriend booked it in for our anniversary dinner (thank you!) and we had a smashing time. The food was amazing, the wine (and sommelier) was perfectly matched and described, and service was great. 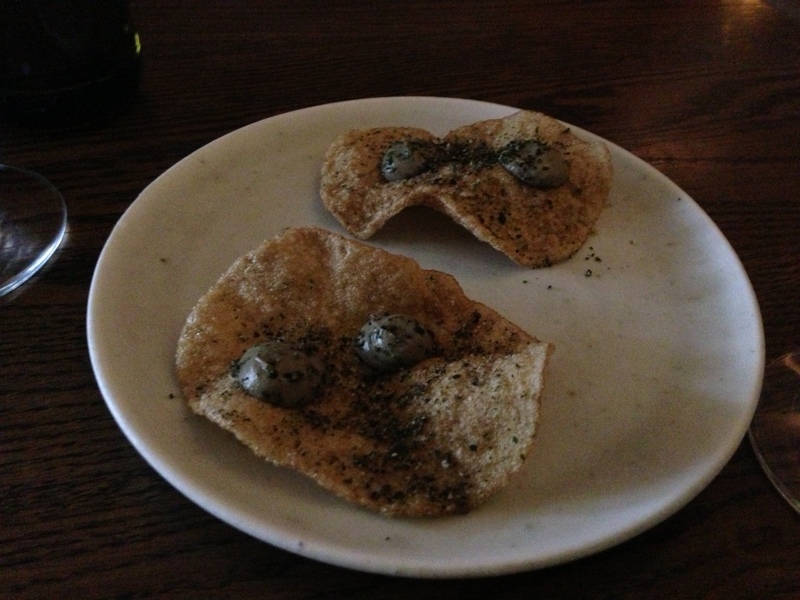 Started with an appetiser of “tapioca chips with seaweed and eggplant puree” which was so, so good! It was crispy, tangy and salty. My boyfriend normally doesn’t like tapioca & seaweed but devoured this. First dish up was the “diamond shell clams“. 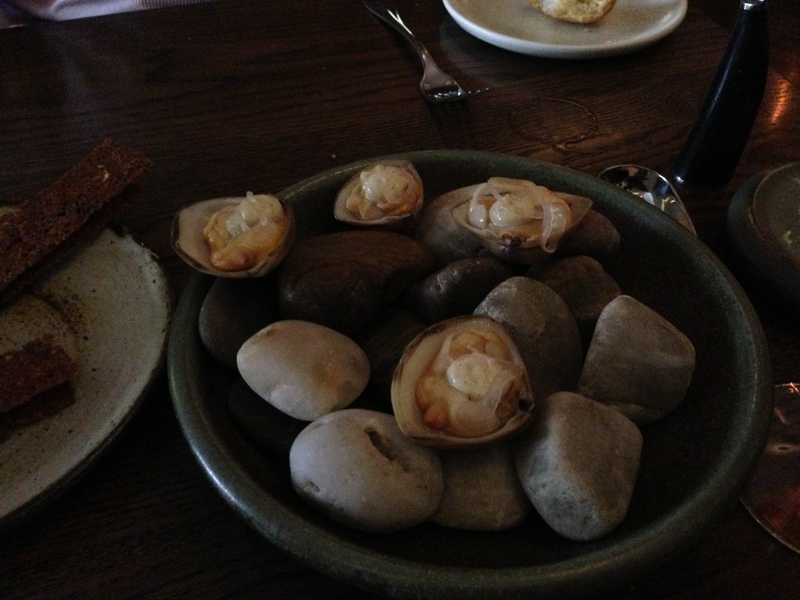 The clams had a strong clam flavour (in a good way) which made them very tasty and thy were enhanced by pickled onion. 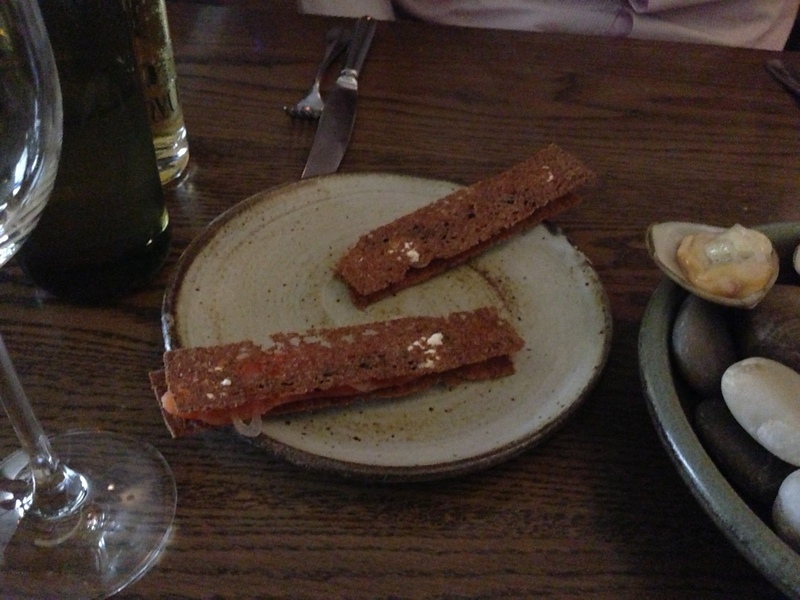 We then had the “smoked trout, rye & avruga” which was basically smoked trout and horseradish cream sandwiched between the thinnest crispiest rye bread. A great classic combo. 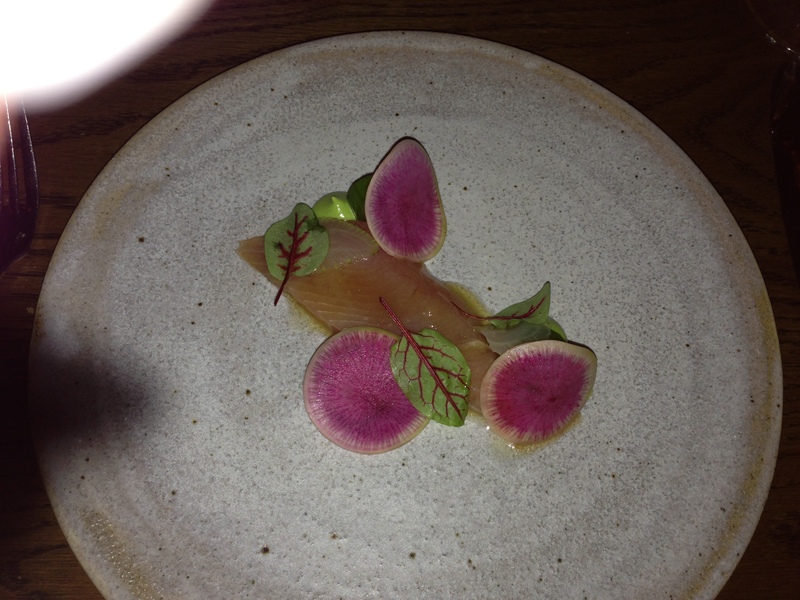 “Bonito sashimi, avocado, sorrel & cucumber” was a lovely light sashimi with avacado and pickled cucumber. It had a soft creamy texture with good flavours, and a very pretty dish. It was a subtle understated dish, not the star of the evening but still lovely. 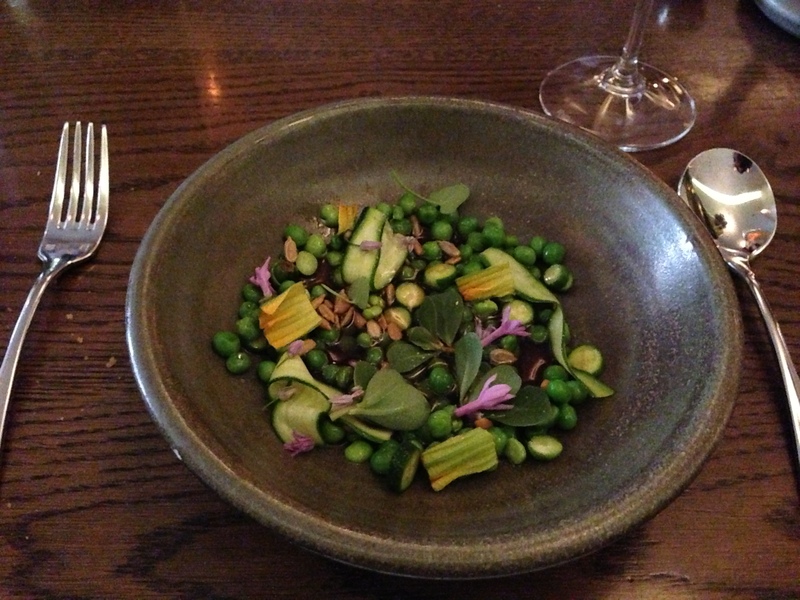 “Peas & zucchini, sunflower seeds, onion & bergamot” is lovely fresh peas in a very tasty broth. Again, a very pretty dish. My boyfriends comment for this dish was “nice way to get me to eat my vegetables”. The “WA marron, wagyu bresaola, iceberg hearts & whipped cod roe” was sensational. 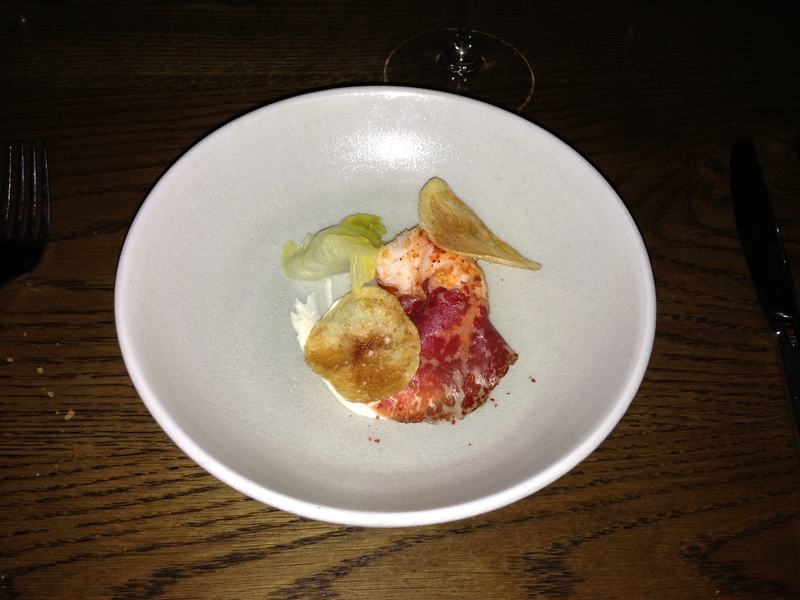 The sweet succulent marron with salty bresaola and crispy chips… omg! Boyfriend also loved it and “could have eated a hundred of them”. 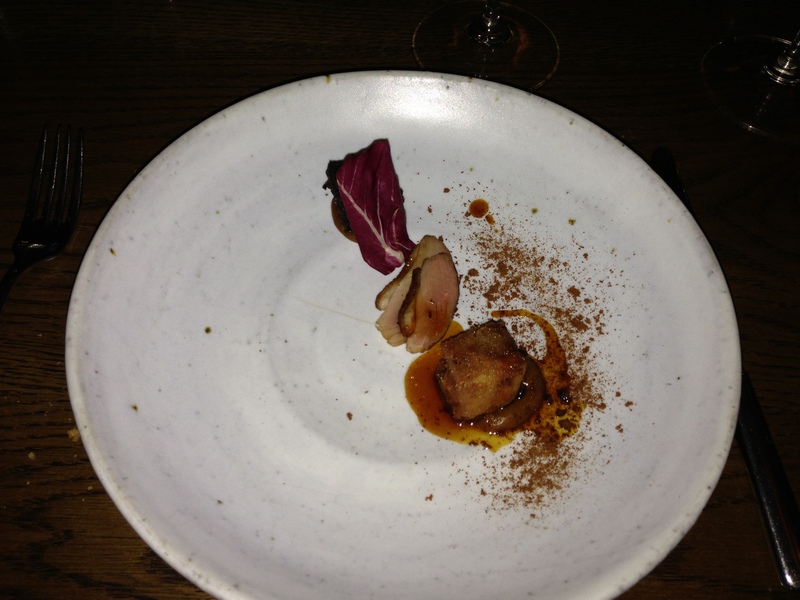 We moved on to the meat dishes and started with “smoked & fried duck, morcilla, carrot and gingerbread“. There was a lovely smoky duck, a crispy confit leg with salty goodness, and delicious blood pudding. It was a really rich dish, so the serving size was perfect in that it left me wanting more. Last dish before dessert was the “wood grilled wagyu rump cap, hay baked carrots & ash“. 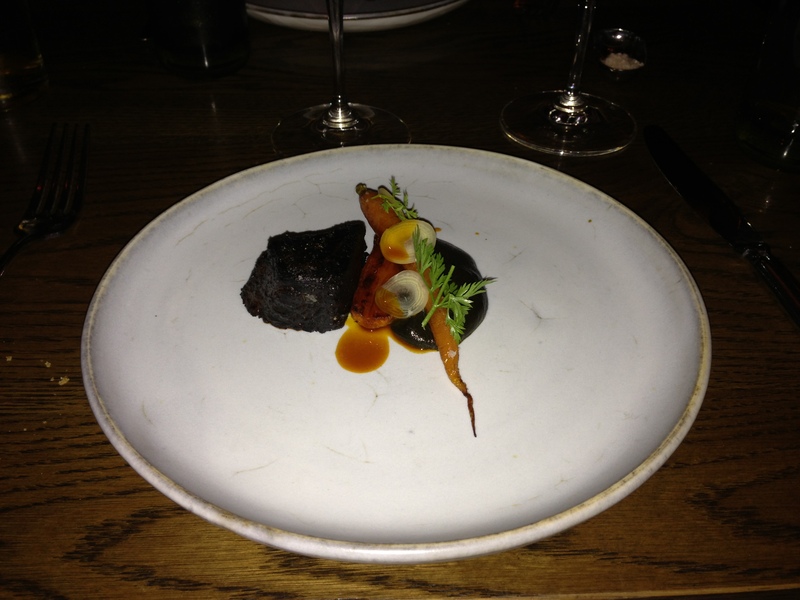 The beef was a bit chewy (not my favourite cut of meat but cooked well) but the sauce and carrot puree was amazing. 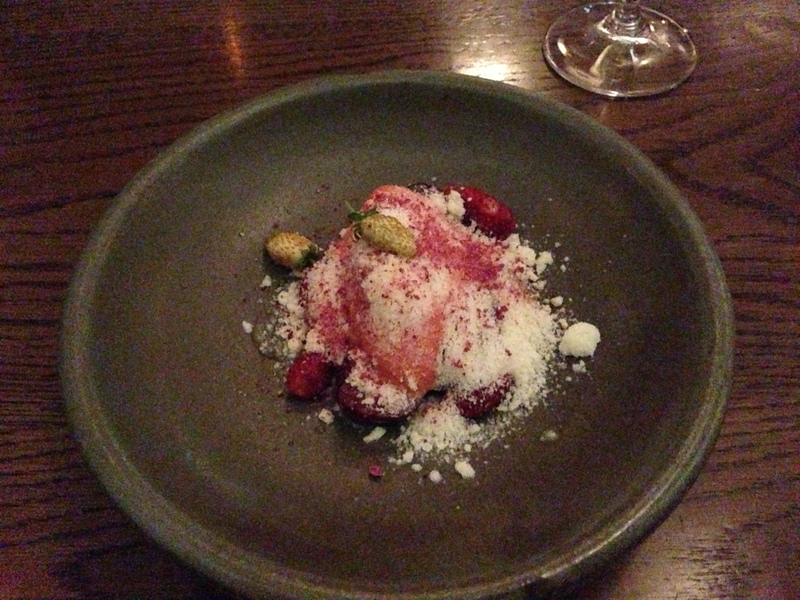 The “wild strawberries, buttermilk snow, sour cherry & shortbread” is my kind of dessert. Strawberries were fresh and light, and the cherries provided a nice pop. 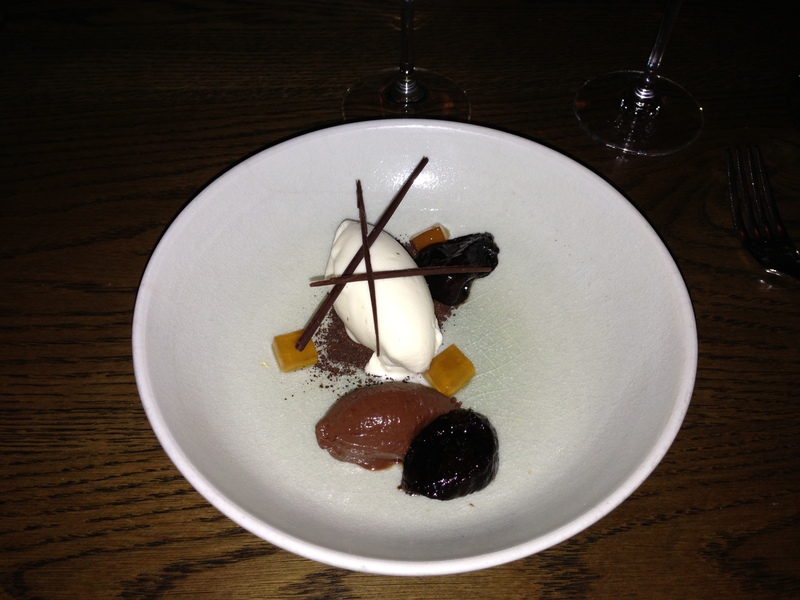 Lastly we had the “Earl Grey ice cream, chocolate, Pedro Ximénez prunes & honey” dessert. The Earl Grey tea ice cream was amazing – the dry tea flavour goes perfectly with chocolate and supersweet prune. The multiple textures and flavours were definitely a winner. So my faith in Cutler & Co. has been restored and I am now a devoted follower. The food was outstanding, wine was outstanding, and service was good and attentive. Can’t wait to go back!